A well-controlled ride is the Edge’s best handling asset, even with the big 21-inch wheels found on the Edge ST. Shifts are smartly executed, and in all, the Edge has more interest in side roads than, say, a Hyundai Santa Fe. 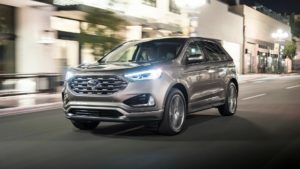 The 2019 Edge has plenty of space for people and cargo, but the base seats could use more bolsters and thicker cushions. They’re flatter than those found in the ST, and with less all-day support. The Edge’s rear bench can hold three adults when it needs to, or fold down for an expanded cargo bay, but the back seat could use more head room for taller passengers. The NHTSA has good things to say about the Edge’s crash protection, but the IIHS is more reserved. This year Ford’s made automatic emergency braking standard across the board, a welcome move. Every Edge comes with power features, Bluetooth with audio streaming, and keyless ignition; spendy Titaniums have leather upholstery and a panoramic sunroof and B&O audio, while the Edge ST can be fitted with performance 21-inch tires and stronger brakes. Prices range from just over $30,000 to more than $54,000 on a fully loaded Edge ST. The 2019 Ford Edge has some fans among us for its style, but not many superfans. The look is uncluttered and spare, only slighter warmer inside its cabin. We think there’s enough appeal in its uncomplicated look to merit a point above average for a 6 overall in styling. With the latest Edge, Ford has drawn on some of the more popular global design themes, while it’s avoided the trendy ones. No floating-roof panels here, just a gentle homage to the BMW X5, with a six-sided grille that could come from a number of automakers. The generic parts are cut and sewn in the right ways, though. The Edge has substantial but not too thick pillars, the glass has just the right amount of rake, and the grille’s just big enough to say crossover—not wagon. On the Edge ST, blacked-out trim runs down the sills and gloss-black wheels lower the look. The Edge has a fairly anonymous cabin that’s more dressy and more appealing than in prior versions. There’s none of the drama injected into the Mercedes GLC, no lush layers of wood trim, but the Edge’s mix of plastic and metallic trim puts smooth surfaces ahead of visual gimmicks, and we’d call that a win. Most welcome are the knobs and switches that returned in this Edge, versus the touch-slide-swipe controls found in the prior version. What we’d change about the Edge? At this point we’re closer to a new model, so things like larger and higher-resolution screens will likely wait until the next version. But some models have lots of gloss-black trim that grabs fingerprints like an hour-long CBS drama. That’s an easy thing to tone down. The powertrain family’s been pared down by one, and with that, the performance permutations of the 2019 Ford Edge have been made clear. Want an efficient family truckster with safe and sound all-wheel drive? That’s a turbo-4. Want a sport-themed SUV with a crisper handling edge? Got it; here’s 50 percent more cylinders and 100 percent more turbos. No matter which you choose, the 2019 Edge carries itself with mindful obedience. Entertaining sass is off the menu, but the 2.0-liter turbo-4 in every Edge save for the ST has enough pull to distinguish itself. It’s up 5 hp this year for a total of 250 hp, and now it’s paired with an 8-speed automatic. It’s strong enough to boost the Edge to 60 mph in less than eight seconds, and with front-wheel drive can turn in 25 mpg on the EPA combined cycle. It’s also able to tow up to 3,500 pounds with the right kit. With a normally aspirated V-6 flushed from its system, the only engine upgrade only comes with the Edge ST. It’s a twin-turbo 2.7-liter V-6, spun up to 335 hp this year from last year’s 315 hp (both rated on 93-octane fuel). Ford says this engine can steam to 60 mph in less than six seconds. It’s punchy through the midrange, less excited about high-revving power trips—and Ford takes its engine noise, doubles it, and pipes it into the Edge ST when it’s put into a Sport driving mode. It’s a distraction from otherwise solid powertrain performance through an automatic with paddle shifters and quicker reflexes than the standard-issue unit. The Edge has an independent suspension, electric power steering, and delivers good body control and precise road feel with a well-controlled ride. It’s much like Ford’s big, fading Fusion sedan in the way it steers crisply into corners and tracks easily down the interstate, and in the way it holds a tight rein on body motion when it thwops over bad ruts. The Edge Titanium adopts bigger wheels, but they don’t diminish the Edge’s well-weighted steering and on-center feel, once it gets up to moderate speeds. Ford had offered an adaptive-steering system on the Edge in prior years, but it’s been deleted, since its benefits in low-speed parking-lot maneuvers were minimal. The Edge ST shows more interest in slinky roads. It puts on its own 20-inch wheels and tires—21-inchers and summer tires on some editions—and has a stiffer suspension tune and more heavily weighted steering when the Sport button on the rotary shift knob is tapped. It’s very firm, but the Edge ST avoids the pitfalls of even the old Edge Sport. Choppy pavement isn’t its enemy. The ST package represents Ford’s first attempt to shore up the “sport” part of the sport-utility equation, and while it’s not a vast change in terms of driving feel, it’s a smart cosmetic package that doesn’t ding the Edge’s user-friendly dynamics.